Don’t Get Better at Interviewing, Get Freaking Fantastic at It! Each step of the hiring process can undoubtedly be improved upon, but interviewing seems to be the one area that the majority of recruiters and hiring managers really need to invest more effort and thought into. The average recruiter will have 22 open positions and well over 3,000 resumes to review at any given time. That equates to a lot of time and resources just to get to the interview process for each of those 22 positions. Making the interview count is vital to the success of the company and the recruiter or hiring manager. 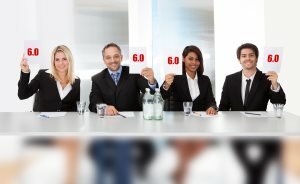 While a lot of factors that determine important employee metrics—like retention or productivity—are ultimately out of the interviewer’s hands, there are certain steps that can be taken to improve the chances of a good hire at the interview level. Many recruiters will do a lot of groundwork to get to the interview process without having any clear understanding of what the position actually entails. At this point, they have already weeded out candidates that could very well have been qualified, and passed through candidates who may be seriously under qualified. Recruiters should have a clear outline of the performance factors that are a must for each position. There has been a big push lately to hire for attitude and train for skills. There is a lot of strength in this practice, but many recruiters have been going about this all wrong. An interview shouldn’t be a chat over coffee. An interviewer can’t properly gauge attitude and behavior without questions specifically aimed at doing so. The interviewer shouldn’t be interested in personal opinions or hobbies that won’t reveal anything about a person’s ability to do the job or fit into the culture. We all have it, no matter how badly we wish we didn’t –pretty bird syndrome. We gravitate toward people like us. This inhibits innovation, diversity, and it can make for a pretty boring workplace. Conducting multi-rated interviews also combats the bias of stereotyping and the all too persuasive first impression. This can be done via a panel interview, but recorded virtual interviews are also a convenient way to pull in other opinions and points of view. Again, virtual interviews offer a recording element that makes it easy to review and compare interviews, but not everyone has this tool at their dispense. With multiple interviews and multiple rounds, it can be nearly impossible to take and organize interview notes that are actually useful. Incorporate a scoring system into the process. It can be as simple as 1-3 for each answer. Retention is a crazy important metric in recruiting, and to be fair, it is one that is largely out of the hands of the recruiter. Take your known retention issues and address them in the interview process. For instance, an article from Chron cites “lack of training” as a leading factor in high turnover. While this probably has very little to do with the hiring manager or recruiter, this is important information. Find out if they are self-starters, if they are willing to ask questions when they need help and how they are best managed. Target turnover issues and ask questions aimed to find the candidates that can hack it or help to remedy the issue. So their resume wowed you and they were smooth as silk in their interview. Heck, they even made you laugh! If the job consists of writing skills and interviewing skills, it makes total sense to hire them, but odds are those aren’t real performance factors of the position. Stick with gauging soft and hard skills. Cut it out with the curve balls in the last stages of the interview process. Things like location, salary and hours are all potential deal breakers or potential selling points. Just be clear about them instead of wasting everyone’s time. You’ve made this candidate wait three weeks only to tell them that the position is offering less than they could take, and it’s an hour away. This puts both you and the candidate back to square one. Improving the interviewing process makes sense on the individual level, as well as for the entire organization. With these seven simple tips, recruiters and hiring managers can combat biases, streamline the process, make more qualified hires, improve retention rates and give the candidate a better experience.